Place canola oil in a braising pot and sear each beef shank 3-4 minutes each side. Place all the remaining ingredients in and fill with hot water. Bring to a boil and simmer for 60 to 75 minutes, or until the beef gets tender. 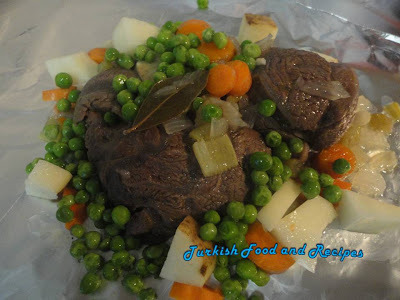 Then, take each beef shank over a piece of aluminum foil and divide the raw vegetables you prepared for baking in four and transfer to each aluminum foil. If desired remove the cooked vegetables from the braising pot and add them as well. Wrap up the foil around the beef shanks and place over an oven tray. Preheat the oven to 400 F (200 C) and bake for about 45-60 minutes. Serve either hot or warm. Kanola yagini buyuk bir tencereye alin ve her bir dana incigini hafifce kizartin (iki tarafini da 3-4 dakika olacak sekilde). Sonra, diger malzemeleri ilave edin ve sicak su ile doldurun. Kaynadiktan sonra kisik ateste yaklasik 60-75 dakika kadar kapagi kapali olarak pisirin. Etlerin yumusayip yumusamadigi kontol edin. 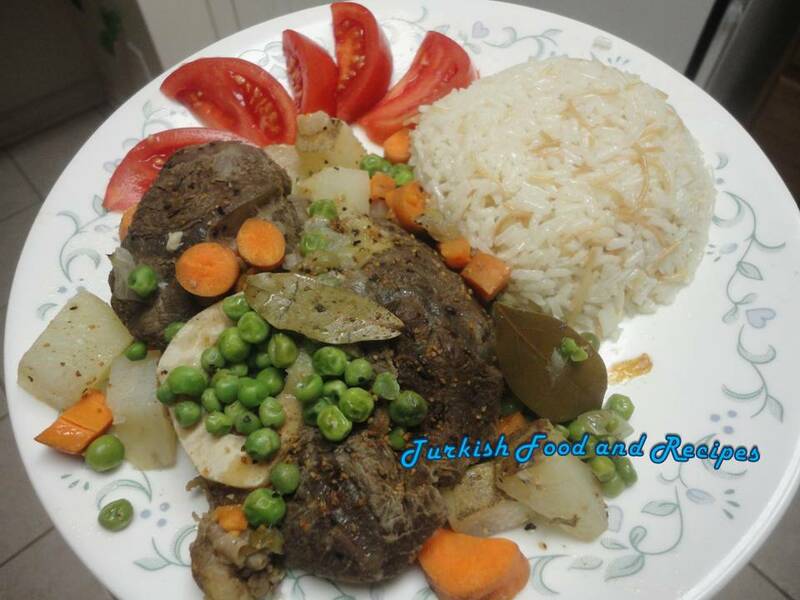 Pistikten sonra, her bir kuzu incigini genisce birer aluminyum folyo uzerine alin ve onceden firinlamak icin hazirladiginiz cig sebzeleri dorde paylastirarak etlerin yanina koyun. Arzu ederseniz, tenceredeki pismis sebzeleri de etlerin yanina paylastirabilirsiniz. Folyoyu guzelce bohca gibi kapatin ve firin tepsisine yerlestirin. Onceden isitilmis 200 C (400 F) firinda yaklasik 45-60 dakika pisirin. I have not had beef shanks in a long time. This would be a great dish for a wintery night. Great plating.